Below is the 13th installment of our weekly PFFELO rankings. Like all ELO systems, PFFELO is an iterative system that updates each team’s rating after each game based on two things: how well they played against their opponent and how well they were expected to play against their opponent. The PFFELO rating system measures the former using our unique offensive, defensive and special teams grades, while the latter is determined by the PFFELO ratings leading up to the game and where the game is played. Another week as our ”Lock of the Week” and another cover for the New England Patriots against a lowly Dolphins team without their starting quarterback. The Patriots gave up exactly one touchdown on defense for the fifth-consecutive week Sunday. After a slow start, all their starting defensive backs have PFF player grades above 73.0, with free agent acquisition Stephon Gilmore now allowing less than one yard per coverage snap on the season. His interception at the end of the first half against Miami helped keep the Dolphins at arm’s length. Since Week 8, edge defender Trey Flowers has given the Patriots the 10th-best pass-rushing productivity (11.8) among his position group, generating 17 total pressures in that time. The sixth-best offense and the fourth-best defense in our rating system have provided great balance for what is the clear frontrunner in the NFC through 12 weeks. There are concerns that the Philadelphia Eagles haven’t beaten anyone, but road wins against the Panthers and the Chargers (especially in hindsight) suggest otherwise. Carson Wentz faces a substantial test this week against a Seahawks defense that has a player of the year candidate in Bobby Wagner (98.5). We have a feeling that the fifth-highest rated passer when under pressure (81.6) and when clean (111.8) has the goods to continue his hot streak and move the Eagles closer to a first-round bye. In winning their third-straight game, the Atlanta Falcons have paid us back for continuing to back them in this rating system, boasting one of the highest-graded offenses and defenses through 12 weeks. Matt Ryan is the league’s highest-graded passer since Week 6, completing 69.0 percent of his passes for 11 touchdowns during that stretch. After a big week against Tampa, Julio Jones is leading all receivers in yards per route run (3.38) by almost half a yard. At 7-4 (the same record they had at this time last year), and with home dates against Minnesota, New Orleans and Carolina left on the schedule (as well as a road game in New Orleans), the Falcons can put themselves in position for a first-round bye if they continue to play like the numbers suggest. While the Pittsburgh Steelers survived a scare at home to a hapless Green Bay team, the close score wasn’t because of their offense. When throwing to Antonio Brown or Le’Veon Bell, Big Ben was 22-of-26 for 257 yards and two touchdowns – helped significantly by 135 yards after the catch. Without Joe Haden (80.8), though, the Steelers have struggled to shut down opposing pass offenses the last two weeks. In the last four games, second-year cornerback Artie Burns has given up 14 receptions (on 21 attempts) for 216 yards and two touchdowns into his coverage (for a 132.2 rating). Luckily for Pittsburgh, they have two of the top four most-efficient pass-rushers among 3-4 defensive ends in Cameron Heyward (12.9 pass-rush productivity) and Stephon Tuitt (10.3) to help suppress some of their issues on the back end. It wasn’t pretty, but the Carolina Panthers continue to win games, and win games on the road (where they’re 5-1). Their win in New York was despite a another poor performance from quarterback Cam Newton, who was only able to complete 8-of-20 passes when clean and 3-of-8 passes when pressured. Beyond 10 yards downfield, Cam was 4-of-14 for 88 yards, completing zero such passes to the right side of the field. While the Panthers are clearly contenders in the NFC South and the NFC in general, they will need more consistency from Newton both through the air and on the ground (he averaged just 3.1 yards per carry against the Jets) to make real waves in the NFC. One of the best stories in the NFL must be the Minnesota Vikings. Without their first two preferred quarterbacks, Minnesota continues to get the most out of Case Keenum (80.4). While having his best season, Keenum is being buoyed by one of the best supporting casts in the league, with almost half of his 282 yards Thursday being generated after the catch (including 70 yards gained on passes behind the LOS). Speaking of supporting cast, the Vikings haven’t lost a game since Dalvin Cook (82.0) went out with an ACL injury in Week 4, with the combination of Latavius Murray and Jerick McKinnon earning 120 rushing yards after contact against Detroit, forcing eight missed tackles in the process. It had to end at some point. The New Orleans Saints caught their first loss since Week 2 in Los Angeles against a Rams team that was able to exploit De’Vante Harris (5-of-9 for 99 yards and a touchdown into his coverage) on the outside and the combination of Kenny Vaccaro (6-of-6 for 82) and Craig Robertson (4-of-4 for 54) on the inside. Alvin Kamara continued to impress on the other side of the ball, turning five carries and six targets into 188 yards and two touchdowns. A good question for the Saints is why they only gave him 11 touches, especially when Drew Brees looked to be a little off all afternoon. The Saints’ signal-caller went only 4-for-11 for 61 yards on passes traveling more than 10 yards downfield against a Rams secondary missing some key pieces on the back end. The Los Angeles Rams rebounded nicely from a tough loss in Minnesota to beat New Orleans. While Brees struggled intermediate-to-deep, Jared Goff was fantastic in that spot, completing all three of his passes between 10-19 yards over the middle of the field, including a touchdown. To the degree that it matters, their run defense continues to struggle, allowing 123 yards on 17 carries (including a 74-yard run). Probably more importantly, Trumaine Johnson (49.0) looks to be playing his way out of the long-term money he’s clamored for the last two offseasons. Although he hasn’t allowed a touchdown yet, he’s already surrendered more yardage (582) into his coverage than he did all last season. While returns are almost entirely positive on Sean McVay and the Rams so far this season, it will be interesting to see how they do if they have to a overcome a deficit elicited by poor defense come playoff time. 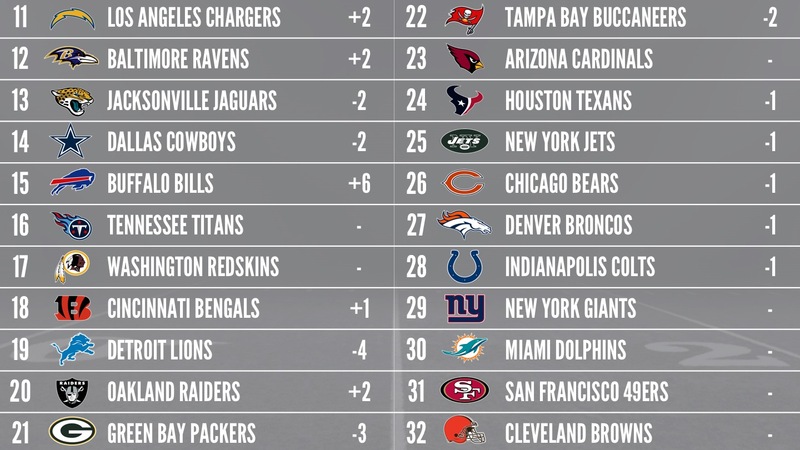 At 7-4, the Seattle Seahawks continue to hang around in a stacked NFC. While their secondary and offensive line have taken blow after blow, they have two players in Russell Wilson (85.5) and Bobby Wagner (98.5) that are among the league’s best at their position. Wilson’s been pressured a lot (39.5 percent of the time), but when kept clean he’s thrown 17 touchdown passes (third) and generated a passer rating over 107.0. Wagner has excelled in many facets, earning the fourth-highest run stop percentage (10.9), the fourth-highest pass-rush productivity (27.7), while missing zero tackles in the passing game and allowing just 0.73 yards per coverage snap. There’s enough star power left on this roster to challenge for a home playoff game come January. The freefall is real, and prior distributions are the only thing keeping the Kansas City Chiefs in this discussion right now. Prior to Alex Smith’s (82.4) fall from grace, the defense was the main concern, habitually in the bottom five in our rating system. When they got their act together on that side of the ball and surrendered only 28 points in two weeks (granted against two poor offenses), the offense was pathologically incapable of keeping up its end of the bargain. From the perspective of expected points, throwing to the tight end is the most efficient means by which to move the ball offensively. The Chiefs have Travis Kelce, who despite recent woes (only four targets against the Bills), is still averaging 2.07 yards per route run (fourth among his position group). If Smith and the Chiefs want to get back on track against the Jets, that’s the place to start.